For the unit established to collect foreign military weapons c. 1976 and later redesignated the 554th Range Group, see 4513th Adversary Threat Training Group. The National Air and Space Intelligence Center (NASIC) is the United States Air Force unit for analyzing military intelligence on foreign air and space forces, weapons, and systems. NASIC assessments of aerospace performance characteristics, capabilities, and vulnerabilities are used to shape national security and defense policies and supports weapons treaty negotiations and verification. In 1917 the Foreign Data Section of the Army Signal Corps’ Airplane Engineering Department was established at McCook Field, and a NASIC predecessor operated the Army Aeronautical Museum[where?] of the Material Division, August 22, 1935. The Office of the Chief of Air Corps's Information Division had become the OCAC Intelligence Division by 1939, which transferred into the USAAF as AC/AS, Intelligence and was known as A-2 (in April, 1942, the Air Intelligence School was at the Harrisburg Academy.) The United States Army Air Forces evaluated foreign aircraft during World War II with the "T-2 Intelligence Department at Wright Field and Freeman Field, Indiana". In July 1944, Wright Field analysts fired a V-1 engine reconstructed from "Robot Blitz" wreckage (an entire V-1 was reconstructed at Republic Aviation by September 8). [verification needed] Post-war, Operation Lusty recruited German technology experts who were interrogated prior to working in the United States, e.g., Dr. Herbert Wagner at a Point Mugu USMC detachment and Walter Dornberger at Bell Aircraft. The "capability…anticipated for Soviet intercontinental jet bombers" (e.g., in NSC 20/4 in the fall of 1945) determined a Radar Fence was needed for sufficient U.S. warning and that the "1954 Interceptor" (F-106) was needed (specified in the January 13, 1949, Air Development Order): "the appearance of a Soviet jet bomber [was in the] 1954…May Day parade". "By 1944, it had become obvious that German aeronautical technology was superior in many ways, to that of this country, and we needed to obtain this technology and make use of it," said P-47 and Messerschmitt ME-262 pilot Army Air Forces Lieutenant Roy Brown during a speech at NASIC in 2014. To accomplish this task, then Col Harold E. Watson was sent from Wright Field to Europe in 1944, to locate German aircraft of advanced design. Watson would become an integral part of forming the intelligence unit that would eventually become NASIC. On May 21, 1951, the Air Technical Intelligence Center (ATIC) was established as a USAF field activity of the Assistant Chief of Staff for Intelligence under the direct command of the Air Materiel Control Department. ATIC analyzed engine parts and the tail section of a Korean War Mikoyan-Gurevich MiG-15 and in July, the center received a complete MiG-15 that had crashed. ATIC also obtained[how?] IL-10 and Yak-9 aircraft in operational condition, and ATIC analysts monitored the flight test program at Kadena Air Base of a MiG-15 flown to Kimpo Air Base in September 1953 by a North Korean defector. ATIC awarded a contract to Battelle Memorial Institute for translation and analysis of materiel and documents gathered during the Korean War. ATIC/Battelle analysis allowed FEAF to develop engagement tactics for F-86 fighters. In 1958 ATIC had a Readix Computer in Building 828, 1 of 6 WPAFB buildings used by the unit prior to the center built in 1976. After Discoverer 29 (launched April 30, 1961) photographed the "first Soviet ICBM offensive launch complex" at Plesetsk;:107 the JCS published Directive 5105.21, "Defense Intelligence Agency", the Defense Intelligence Agency was created on October 1, and USAF intelligence organizations/units were reorganized. In 1961 ATIC became the Foreign Technology Division (FTD) which was reassigned to Air Force Systems Command (AFSC), and FTD intelligence estimates were subsequently provided to the National Security Council through the 1962 United States Intelligence Board (cf. the CIA's Board of National Estimates). :111 FTD's additional location at the Tonopah Test Range Airport conducted test and evaluation of captured Soviet fighter aircraft (AFSC recruited its pilots from the Edwards AFB Air Force Test Center). The aircraft of the 1966 Iraqi Air Force MiG-21 defection was transferred to Nevada within a month of the flight, and the 1968 US Air Force and Navy HAVE DOUGHNUT project flew the aircraft at Area 51 for simulated air combat training (renamed HAVE DRILL and transferred to the Tonopah TTR c. 1968). U.S. casualties flying foreign aircraft included those in the 1979 Tonopah MiG-17 crash during training versus a Northrop F-5 and the 1984 Little Skull Mountain MiG-23 crash which killed a USAF general. FTD detachments were located in Virginia, California (Det 2), Germany, Japan (Det 4), and Det 5—first in Massachusetts and later Colorado (Buckley ANGB). By 1968 FTD had an "Aerial Phenomenon Office" and in 1983, FTD/OLAI at the Cheyenne Mountain Complex published the Analysis of Cosmos 1220 and Cosmos 1306 Fragments. 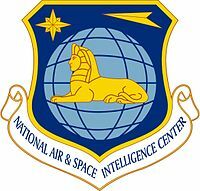 In October 1993 at the end of the Cold War, FTD became the National Air Intelligence Center as "a component of the Air Intelligence Agency", and by 2005 had a Signals Exploitation Division  after being renamed the National Air and Space Intelligence Center on February 15, 2003. NASIC's Defense Intelligence Space Threat Committee coordinates "a wide variety of complex space/counterspace analytical activities." The Center includes a library with interlibrary loan to Air University, etc. ^ Providing Invaluable Intelligence – A Brief History of the National Air and Space Intelligence Center (NASIC_history.pdf)|format= requires |url= (help) (Report). ^ a b c d National Air and Space Intelligence Center History (AFD-120627-049) (Report). ^ Ehrhart, Robert C.; et al. Piercing the Fog: Intelligence and Army Air Forces Operations in World War II. pp. 42, 117, 483. Retrieved 2013-06-10. ^ Ordway, Frederick I, III; Sharpe, Mitchell R (1979). The Rocket Team. Apogee Books Space Series 36. New York: Thomas Y. Crowell. pp. 57, 114, 117, 174b–e, 251, 258d. ISBN 1-894959-00-0. Archived from the original (index) on 2012-03-04. ^ History of Strategic Air and Ballistic Missile Defense: Volume I: 1945–1955 (Army.mil PDF). Retrieved 2011-09-13. ^ Jacobs, James, Senior Airman. "World War II pilot speaks at NASIC". Retrieved 2014-09-23. ^ a b Burrows, William E. (1986). Deep Black: The Startling Truth Behind America's Top-Secret Spy Satellites. Berkley Books. ISBN 0-425-10879-1. It is doubtful that the AAF knew much about the performance of the first Soviet jet fighters (obtaining such information, after all, was what the reconnaissance frenzy was all about). ^ Fennessy, D (12 January 1983). Analysis of Cosmos 1220 and Cosmos 1306 Fragments (Secret) (Report AH-23)|format= requires |url= (help) (Report). Cheyenne Mountain, Colorado: FTD/OLAI. ^ "National Air Intelligence Center" (PDF). Retrieved 2013-02-13. This page was last edited on 13 December 2018, at 07:36 (UTC).